Siding isn't waterproof? | Melotte, Morse, Leonatti, Parker, LTD.
What Do You Mean My Siding is Not Waterproof? Most houses and many small businesses today have vinyl siding on at least part of the exterior. Vinyl is a plastic material and so it seems like it should be waterproof. Your vinyl flooring protects against water as does the plastic shower curtain. It just makes sense plastic siding is waterproof as well. Well, it’s not. In reality, vinyl siding is a watershed, not an impermeable water barrier. That means it sheds water quickly and keeps most of it away from places where it might get into materials that could decay. It’s kind of like an umbrella that sheds rain. It keeps you mostly dry, but does not keep all moisture away. 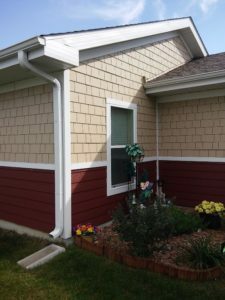 When vinyl siding is installed, the bottom is snapped into a channel on the piece below and it is loosely nailed to the vertical building sheathing (sheets of wood or particle board that support the siding). Individual siding “boards” are lapped with no sealant. In fact, if you examine closely, you can stick your hand right into the lap joint. At the ends of the pieces, there are channels that cup the end of the boards. Again, there is a gap at the end between the channel and the siding. It is actually important to leave a quarter of an inch or so because the siding expands and contracts with temperature and if you nail it tight or don’t allow it room to expand; it will buckle and distort. Buildings are also subject to water vapor. All that humidity in summer that makes it seem like you’re under water? Your house or business feels it too. And the vinyl siding does nothing to prevent it getting behind it and at the sheathing. And the sun shining on the siding actually pressures the vapor against the sheathing. So what keeps the water out? The actual water barrier is the plastic sheet or asphalt covered felt paper under the siding. The siding acts as an initial water shed and also protects the sheet goods from physical damage. The technical term for the synthetic product is an “air and water barrier”. It goes by trade names like Tyvek Housewrap by DuPont, but Housewrap, like Kleenex, has almost become a generic term for a synthetic sheet good designed to go under exterior finishes like siding. The felt paper is an older solution and is often found under old wood siding. Both products prevent liquid water from getting to the wood and also prevent (or inhibit) air transmission which keeps vapor from the wood as well. 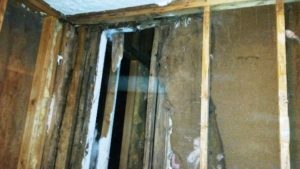 If the wood gets wet, it can mold and deteriorate which can cause many water-related issues ranging from health concerns to the integrity of the structure. Many times when investigating mold or leaks, we find the air and water barrier has been compromised by a tear or an unsealed penetration by cable TV lines or coolant piping. So, damaged siding does not necessarily mean water can get into the house although it has reduced the amount of protection. We at MMLP are experts at finding causes and solutions to water infiltration issues, but you can check the exterior for obvious problems yourself. Walk around the exterior and really look at the siding for gaps between pieces, loose boards or damage. What one really needs to look for when checking out damaged siding is if the damage to the siding also caused a tear in the barrier. Also it is good to check the holes drilled by technicians and contractors to bring utilities into the house to make sure they are sealed.